CHARLESTON — Despite an attempt by House members to propose a deal to let two justices of the West Virginia Supreme Court of Appeals off the hook, all sitting justices will face trial in October and November, as well as a justice who resigned last month. The West Virginia Senate met as a jury Tuesday for pre-trial hearings. Acting Chief Justice Paul Farrell set trial dates for Chief Justice Margaret Workman, Justices Allen Loughry and Beth Walker, and former justice Robin Davis. Walker will face trial in the Senate on Oct. 1, followed by Workman on Oct. 15, Davis on Oct. 29 and Loughry on Nov. 12. The dates were set after the Senate recessed to consider an agreement among Workman, Walker and impeachment managers appointed by the House of Delegates. The impeachment managers, acting as the prosecution, made a deal Monday with Workman and Walker. According to the agreement by the parties, the justices agreed to acknowledge and take responsibility for the millions of dollars in questionable spending by the court, including $3.4 million in office renovations. Workman and Walker also agreed to acknowledge the need for policies and procedures to correct issues identified by the articles of impeachment adopted by the House of Delegates last month, according to the agreement. They also agreed to continue to implement reforms to prevent inappropriate expenditures and follow all laws and regulations. The deal, however, was contingent on the Senate agreeing to vote for a resolution to censure Workman and Walker. When the Senate gaveled in Tuesday afternoon, state Sen. Charlie Trump, R-Morgan, made a motion to consider the resolution. Senate Majority Leader Ryan Ferns, R-Ohio, challenged the motion and Senate President Mitch Carmichael, R-Jackson, ruled against Trump’s motion. Delegate John Shott, R-Mercer, is chairman of the House Judiciary Committee that conducted impeachment investigations over the months of July and August. As head of the House impeachment managers, Shott apologized for wasting the time of the Senate. Ferns said he is unaware of any meeting between House impeachment managers and senators. He said the first time the Senate Republican caucus had heard about the deal was when it was presented Tuesday morning. For Ferns, the rules adopted by the Senate for the impeachment trial process do not address the House managers being able to make deals or present resolutions. Workman, Loughry and Walker were charged by the House in 10 articles of impeachment. Workman is charged in two articles, and Loughry is charged alone in six. Walker is charged — along with the remainder of the sitting justices — with not implementing policies to control spending, inventory, travel use of state property and taxable benefits. Workman is charged twice with the overpayment of 10 senior status judges over statutory limits set in state code, costing the state $270,000. Loughry is charged with spending $367,915 on office renovations and furnishings, using state vehicles and fuel cards for personal use, taking an antique desk and a couch donated to the court to his own home, having state computers set up in his home for use by his wife and son and lying under oath to a legislative committee. Loughry — the only justice to attend Tuesday’s pre-trial hearing in person — will face trial Oct. 2 on a 25-count federal indictment, including charges of obstruction of justice and witness tampering. 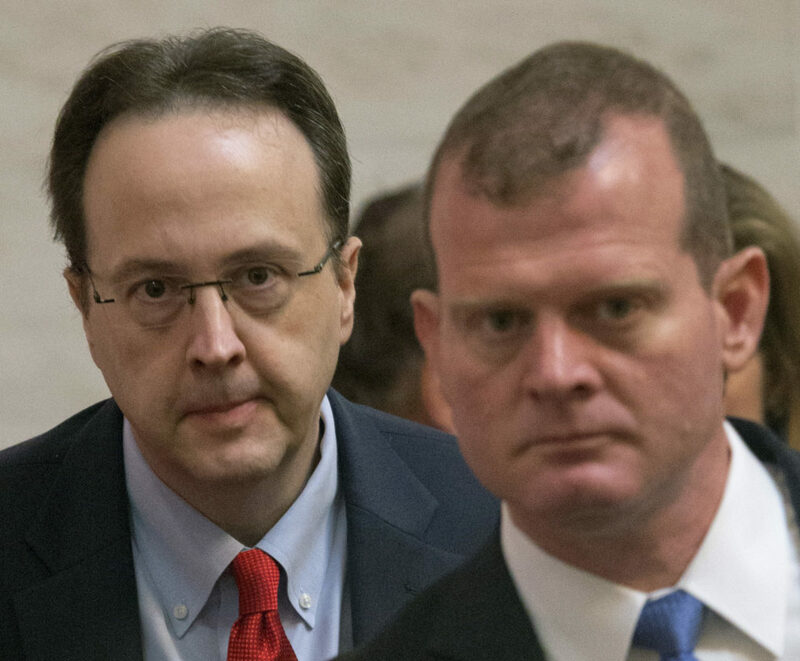 The state Judicial Investigation Commission also charged Loughry in a 32-count complaint for violations of the Judicial Code of Conduct. Former justice Robin Davis was charged last month with several articles of impeachment, including the article that includes all justices. She also was charged on her own and together with Workman in articles dealing with senior status judge overpayments, plus an article for spending more than $500,000 on her office renovations and furnishings. Davis announced her resignation Aug. 14, but the impeachment charges against her have not been dismissed. A motion by Trump to dismiss the articles of impeachment against Davis failed 19-15 with members of both parties rejecting it.